Certain man-made and natural elements can cause concrete to buckle, crack, chip, and deteriorate. Repairing the concrete is essential due to the fact that even the smallest blemish can allow elements such as dirt and water to get into the concrete and make the problem even worse. That is why, at the first signs of concrete damage, you get an experienced concrete repair company in to inspect it and offer the best repair solutions for your damaged concrete. If the concrete floors in your home or business are showing signs of deterioration, contact Polyjacking.com for a free inspection. Drilling a small 5/8" hole through the affected concrete. 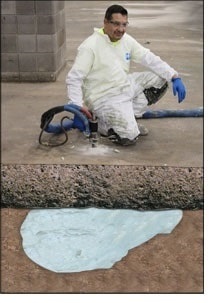 Polyurethane has a short hardening time, so the concrete surface is ready for use after about 15 minutes. Polyurethane is waterproof so it prevents any future erosion problems. After your concrete floor is lifted and stabilized, it will stay that way for many years to come. For any of your concrete floor leveling or lifting needs, contact the professionals of Polyjacking.com help.